A team of scientists lead by prof. Stein Aerts (VIB-KU Leuven) is the first to map the gene expression of each individual brain cell during aging in fruit flies. Their resulting "cell atlas" provides unprecedented insights into the workings of the brain as it ages. Published today in the scientific journal Cell, the atlas is heralded as an important first step in the development of techniques that can contribute to a better understanding of human disease development. The brain of a fruit fly consists of some 100,000 cells, and although that makes it much smaller than the human brain, it contains hundreds of different types of neurons and other cells forming a complex network, much like the human brain. "To truly understand the workings of the brain, even for organisms as small as the fruit fly, we need to zoom in on each and every individual cell," explains prof. Stein Aerts (VIB-KU Leuven). "All organs and tissues are composed of many different cells that communicate with each other to perform their specific functions. Although they share the same DNA, they all express a distinct set of genes, and to understand what is really going on, we need to know which cells are doing what and when." 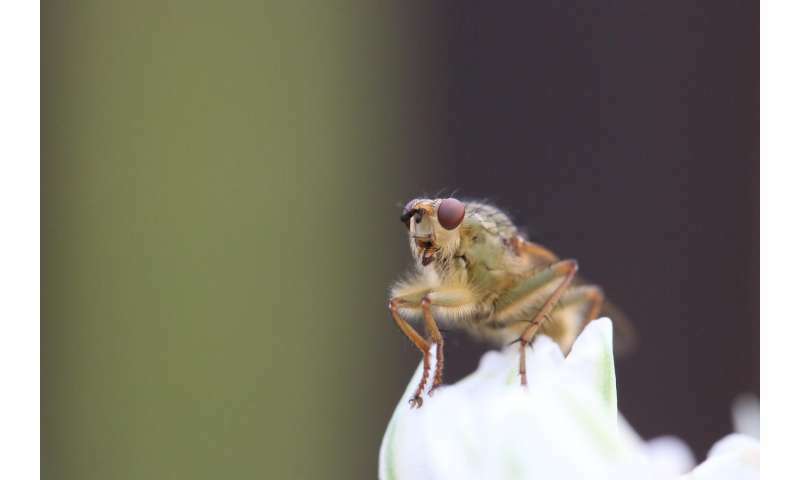 Working with fruit flies as model organisms, the scientists took the challenge head on, immediately starting with the most complex organ of all—the brain. Kristofer Davie, one of the many researchers involved in this team effort, says that this was no easy task: "There are about 15,000 genes and roughly 100,000 cells in the fly brain. So a quick calculation shows we are looking at more than a billion data points to analyze and map over time." The only way to mine this enormous amount of data is with a little help from artificial intelligence. The team used machine-learning methods to accurately predict the age of a cell, based on information gathered from brain cells of flies at different ages. Similar to the human brain, the fly brain has distinct cells responsible for sleep, memory, smell, etc. The researchers catalogued more than 80 different cell type clusters, and interestingly, also found that not all of them age in the same way. Mapping gene expression in thousands of cells is an arduous job, so what drove the team on their mission? "Cells constantly change their role: as they age, in response to changes in the environment, upon disease," explains Stein Aerts. "The holy grail is to assess the molecular state of a patient's tissues and cells in real time, allowing for early diagnosis of any disease and effective, personalized treatments. But to get there we need to develop both the models and the tools to understand the dynamics of cellular changes." The map of the aging fly brain is thus first and foremost an important technological feat. Aerts' team is the first in the world to map the brain of an entire organism at this level of detail. Developing biomedical applications will require more work, and by definition collaboration. That is why Aerts is part of a large pan-European consortium, called LifeTime, which aims to revolutionize healthcare by tracking and understanding cellular changes during disease. "We have made all of our fly brain data freely available on a unique online analysis platform, where other scientists can deposit their data as well," says Aerts. Together with international colleagues who use single-cell technology to study different organs of the fruit fly, he founded the Fly Cell Atlas consortium. "It is a really exciting time for biomedical research. By looking at gene expression at single-cell resolution, we are uncovering so much information we can barely keep up." More information: A single-cell transcriptome atlas of the ageing Drosophila brain, Davie et al., Cell 2018. It would be completely groundbreaking to fly a fighter jets with drosophila brain cells or a complete drosophila brain this would surely pave the way for autonomous driving space drones that would bypass any existing technolog,even cutting edge military technology.